Everyone says it: “Samsung makes the best displays for smartphones.” It’s widely regarded as truth and not many try to dispute it. Even fewer try to (or even know how to) individually assess the display. The problem with this is the lack of verification from what is seen on publications (including our own) versus reality and the limited number of valid points of views and shortage of expertise on the matter. What many don’t know is that previous-generation Samsung Galaxy displays did have issues and even lagged behind the competition in certain categories such as color/white point calibration, gamma, and black clipping. They were not perfect displays — they were far from the best in terms of calibration, actually — and most display reviews gave them way more praise than they deserved. Many are also misinformed and claim their displays to be color-accurate when in their default oversaturated profile. However, a new generation of handsets gives emergence to new hope and expectations. The Galaxy S10 is Samsung’s latest endeavor in reeling in future technologies to the handsets of now, but besides its cutting-edge Infinity-O display, has its underlying panel characteristics actually improved, or has it just been facelifted? We’ve received information that suggests that the Exynos and Snapdragon S10 variants have different panel calibrations. This review will cover the Exynos variant. I will look into the differences with the Snapdragon variant and hopefully create a revision. The front of the Galaxy S10 is plastered with what Samsung calls their “Infinity-O” display: a screen that covers nearly the entirety of the front of the handset, curving around the edges, with an “O” punched out of it to accommodate a front-facing camera. Next to the camera is the ambient light sensor and proximity sensor, which are cleverly hidden underneath the glass. The panel has a native resolution of 3040×1440 pixels, but by default, the Samsung Galaxy S10 renders at 2280×1080 to save power. This comes with a glaring compromise since this default render resolution does not divide wholly into its native resolution, resulting in added blurriness in its upscaling. Consequently, the Samsung Galaxy S10 display at its default render resolution will not appear as sharp as a native 2280×1080-resolution panel of the same size. The Samsung Galaxy S10e, for example, appears sharper than the Galaxy S10 in its default 1080p render resolution, even if the Galaxy S10e were to be scaled up to the Galaxy S10’s size. The display is the brightest OLED we have measured at all APLs, reaching nearly 900 nits for 50% APL, which is a good APL to consider the average display brightness (you can read the definition of APL below in the “Brightness” segment), when the phone detects bright light in auto brightness mode. 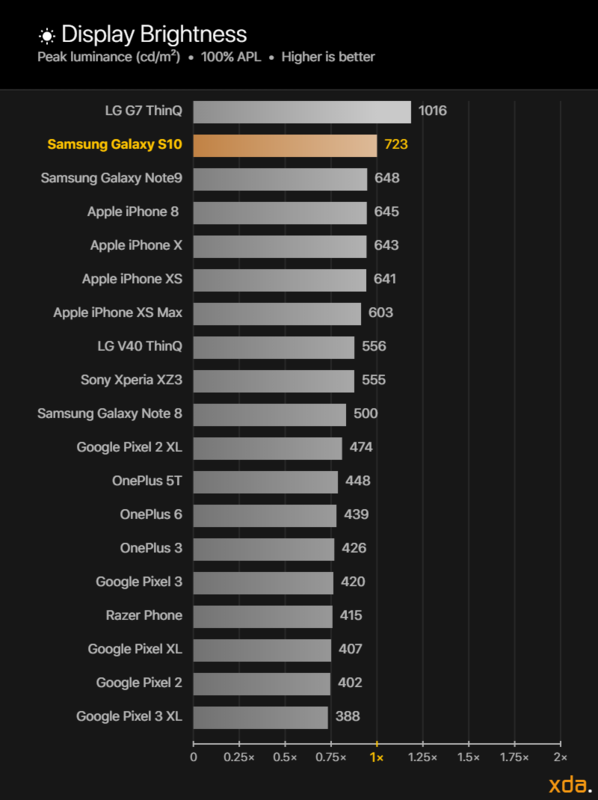 This is about 100 nits higher than we measured for the Samsung Galaxy Note 9 and LG V40 ThinQ (appearing about 5% brighter) and about 200 nits higher than the iPhone XS (appearing about 10% brighter). The Samsung Galaxy S10’s display also lightens all colors when it detects sunlight, lowering the screen contrast, which improves the display’s legibility and color accuracy under sunlight. 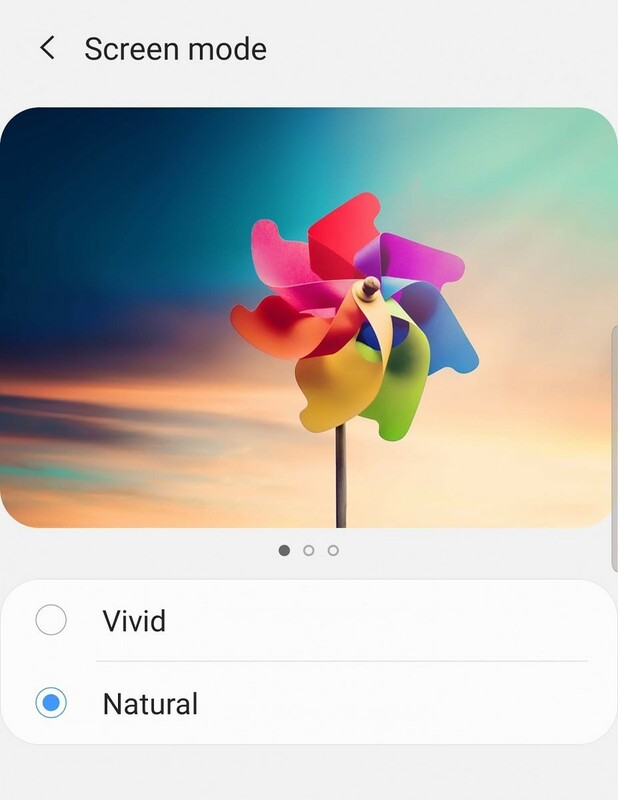 Depending on the location, the default color mode on the Galaxy S10 may be set to the “Natural” profile for the U.S. and some of Europe, while primarily Asia will have it default to the “Vivid” profile (our Exynos unit came in “Vivid”). The “Natural” option is the color-accurate profile with a warmer tint, while the “Vivid” profile increases the saturation and contrast of the screen and has a cooler white point. The “Vivid” profile is identical to the “Adaptive” profile found on previous Galaxy phones, and it stretches colors out significantly, up to the native gamut of the Galaxy S10’s panel. It also has increased contrast and gets slightly brighter than the “Natural” profile. For sharing and editing content, the “Natural” profile should always be used to ensure that photos and videos will look similar across other displays, like iPhones, which share the same target color profile as the Galaxy S10’s “Natural” profile, not the “Vivid” profile like many have been misled to believe. The “Natural” profile targets the sRGB color space by default and is also calibrated to target wide color spaces like P3 and Adobe RGB when app-supported color management is available for appropriate media. As usual, Samsung does a decent job with color accuracy with their standard reference profiles, but the Galaxy S10 continues Samsung’s warmer calibration trend that plagued their previous handsets, still placing it behind other displays like the iPhone X(S) and the Pixel 3 (XL) in color accuracy. Still, the color accuracy of the “Natural” profile is excellent and appears mostly perfect, though whites and pale tones will appear noticeably warm. The profile has a gamma of approximately 2.15, with light shadows and slightly darker mid-tones, but overall has excellent image reproduction and contrast. Video playback increases the on-screen contrast, darkening the shadows for a crunchier picture. However, even though this is the color-accurate profile, Samsung still stretches out and oversaturates the colors in its default launcher, which designers should consider and be wary about when viewing their icons on the Galaxy S10. The viewing angles on the Samsung Galaxy S10, at a 30-degree angle, are the lowest we’ve measured so far. However, the numbers don’t tell the whole story. The shift is still non-uniform and sudden at acute angles, and still noticeably varies between shifting towards red and shifting towards cyan (technically it shifts away from the complementary). Additionally, the color shift increases further towards cyan past 30 degrees, which we did not measure. It is also always visible on the curved edges of the screen on lighter/white content. Because of these intricacies that are difficult to fully account for, our crown for best viewing angles still belongs to the LGD panel on the LG V40 ThinQ, with even the Pixel 3’s viewing angles also beating out the Galaxy S10’s. Black smearing is identical to previous generation panels, while black clipping (black crush) has improved (lessened) with the Samsung Galaxy S10. The Galaxy S10, however, is still inferior to OnePlus’ latest handsets in black clipping, and outclassed by the iPhone X-series panels in both these categories. The lifted shadows of the Galaxy S10 in its “Natural” profile do help in reducing the perception of black crush, but it remains non-optimal for accurate shadow rendition. To obtain quantitative color data from the display, we stage device-specific input test patterns to the handset and measure the display’s resulting emission using an i1Pro 2 spectrophotometer. The test patterns and device settings we use are corrected for various display characteristics and potential software implementations that can alter our desired measurements. Many other sites’ display analyses do not properly account for them and consequently, their data may be inaccurate. We first measure the display’s full grayscale and report the perceptual color error of white, along with its correlated color temperature. From the readings, we also derive the display gamma using a least-squares fit on the theoretical gamma values of each step. This gamma value is more meaningful and true-to-experience than those that report the gamma reading from display calibration software like CalMan, which averages the theoretical gamma of each step instead. 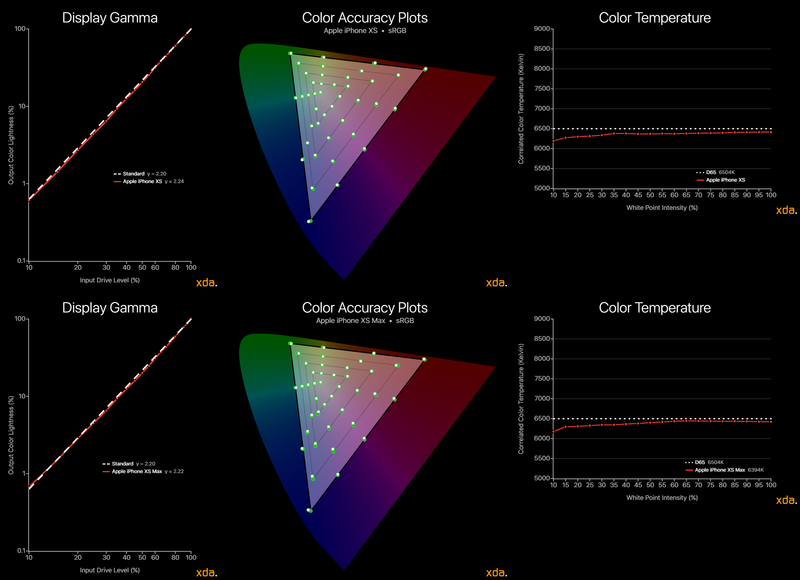 The colors that we target for our test patterns are inspired by DisplayMate’s absolute color accuracy plots. The color targets are spaced roughly even throughout the CIE 1976 chromaticity scale, which makes them excellent targets to assess the complete color reproduction capabilities of a display. The grayscale and color accuracy readings are taken in increments of 20% over the display’s perceptual (non-linear) brightness range and averaged to achieve a single reading that is accurate to the overall appearance of the display. Another individual reading is taken at our reference 200 cd/m² which is a good white level for typical office conditions and indoor lighting. We primarily use the color difference measurement CIEDE2000 (shortened to ΔE) as a metric for chromatic accuracy. ΔE is the industry standard color difference metric proposed by the International Commission on Illumination (CIE) that best describes uniform differences between colors. Other color difference metrics exist as well, such as the color difference Δu′v′ on the CIE 1976 chromaticity scale, but such metrics have been found to be inferior in perceptual uniformity when assessing for visual noticeability, as the threshold for visual noticeability between measured colors and target colors can vary wildly between color difference metrics. For example, a color difference Δu′v′ of 0.010 is not visually noticeable for blue, but the same measured color difference for yellow is noticeable at a glance. Note that ΔE is not perfect itself, but it has come to be the most empirically-accurate color difference metric that currently exists. ΔE normally considers luminance error in its computation, since luminance is a necessary component to completely describe color. However, since the human visual system interprets chromaticity and luminance separately, we hold our tests patterns at a constant luminance and compensate the luminance error out of our ΔE values. Furthermore, it is helpful to separate the two errors when assessing a display’s performance because, just like our visual system, it pertains to different issues with the display. This way we can more thoroughly analyze and understand the performance of a display. When the measured color difference ΔE is above 3.0, the color difference can be visually noticed at a glance. When the measured color difference ΔE is between 1.0 and 2.3, the difference in color can only be noticed in diagnostic conditions (e.g. when the measured color and target color appear right next to the other on the display being measured), otherwise, the color difference is not visually noticeable and appears accurate. A measured color difference ΔE of 1.0 or less is said to be completely imperceptible, and the measured color appears indistinguishable from the target color even when adjacent to it. Display power consumption is measured by the slope of the linear regression between the handset battery drain and display luminance. Battery drain is observed and averaged over three minutes at 20% steps of brightness and trialed multiple times while minimizing external sources of battery drain. Samsung overhauled its Screen Mode options on the Galaxy S10, and instead of having the previous “Adaptive,” “Photo,” “Cinema,” and “Basic” screen modes, it has been simplified to just two options, “Vivid” and “Basic,” with the default option depending on the carrier/vendor from which the Galaxy S10 was purchased. Samsung says that “Natural” is default in Europe and in the U.S. while “Vivid” is default in Asia. This is the first time Samsung has pushed to make the color-accurate profile the default, which is significant since most users are likely accustomed to Samsung’s oversaturated profile that has been the default in all their previous OLEDs. 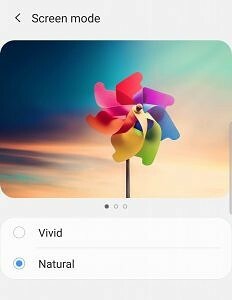 The “Vivid” profile is identical to the “Adaptive” profile on previous Galaxy devices, simply renamed to be more appropriate, and keeping the option to adjust the color temperature and the individual red/green/blue color balance sliders. There is no form of active color management in this profile, but it receives contrast and color modifications made by Samsung’s mDNIe (mobile Digital Natural Image engine) in some scenarios. The “Natural” profile is what replaces the three reference color profiles (“Basic,” “Cinema,” and “Photo”) on the previous Galaxy devices. They’ve done this because Samsung finally implemented support for Android 8.0’s automatic color management on the Galaxy S10, which is a big step in the right direction for expanding its adoption across Android. Supported apps, which include Samsung’s own Gallery app, now properly displays content with embedded ICC profiles, a feature that Google’s own Photos app hasn’t fully rolled out yet. This support is what is needed for other Android devices to properly play back the Samsung Galaxy S10’s HDR10+ videos. Without proper color management support, the videos will play back in standard dynamic range. 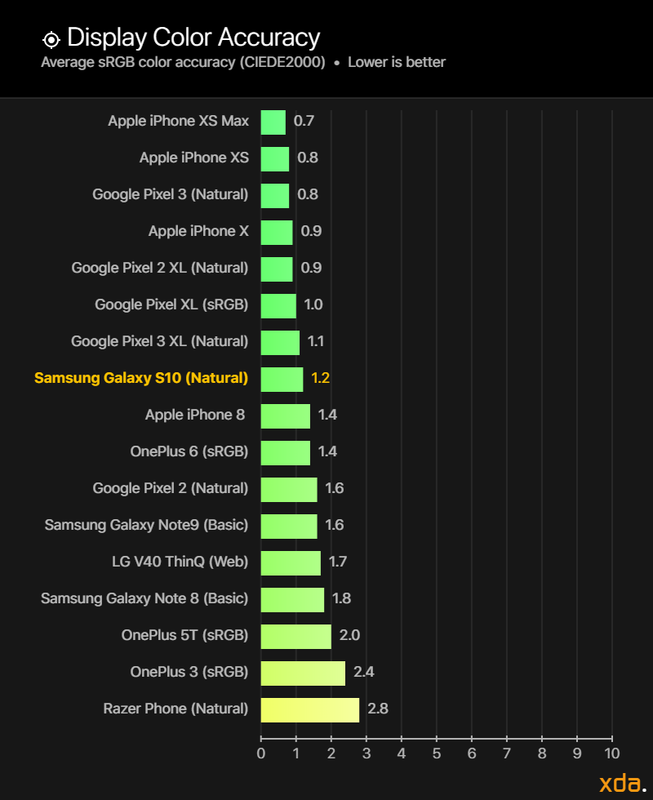 Our display brightness comparison charts compare the maximum display brightness of the Samsung Galaxy S10 relative to other displays that we have measured. 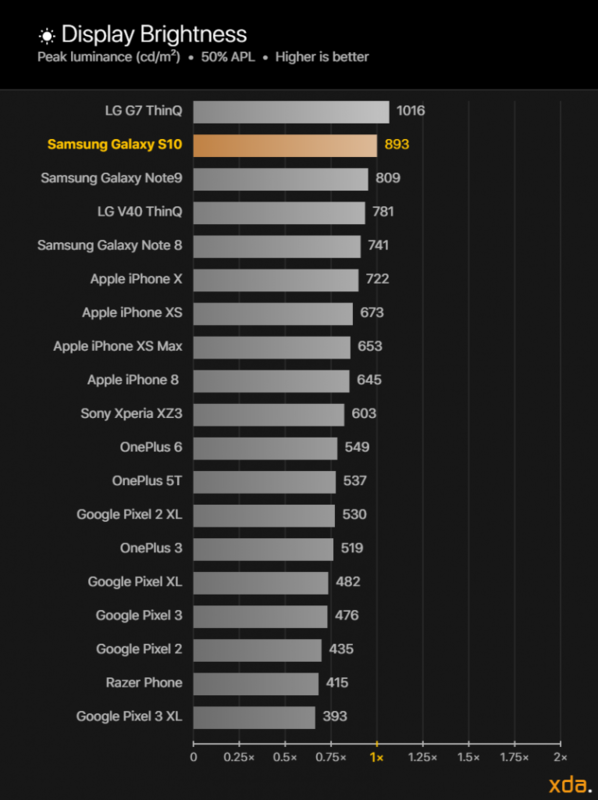 The labels on the horizontal axis on the bottom of the chart represent the multipliers for the difference in perceived brightness relative to the Samsung Galaxy S10 display, which is fixed at “1×”. The magnitude of the displays’ brightnesses, measured in candelas per square meter, or nits, are logarithmically scaled according to Steven’s Power Law using the modality exponent for the perceived brightness of a point source, scaled proportionally to the brightness of the Samsung Galaxy S10 display. This is done because the human eye has a logarithmic response to perceived brightness. Other charts that present brightness values on a linear scale do not properly represent the difference in perceived brightness of the displays. When measuring the display performance of an OLED panel, it is important to understand how its technology differs from traditional LCD panels. LCDs require a backlight to pass light through color filters that block wavelengths of light to produce the colors that we see. An OLED panel is capable of having each of its individual subpixels emit their own light. This means that the OLED panel must share a certain amount of power to every lit pixel from its maximum allotment. Thus, the more subpixels that need to be lit up, the more that the panel’s power needs to be divided over the lit subpixels, and the less power that each subpixel receives. The APL (average pixel level) of an image is the average proportion of each pixels’ individual RGB components across the entire image. As an example, a completely red, green, or blue image has an APL of 33%, since each image consists of completely lighting up only one of the three subpixels. The complete color mixtures cyan (green and blue), magenta (red and blue), or yellow (red and green) have an APL of 67%, and a full-white image that completely lights up all three subpixels has an APL of 100%. Furthermore, an image that is half black and half white has an APL of 50%. Finally, for OLED panels, the higher the total on-screen content APL, the lower the relative brightness of each of the lit pixels. 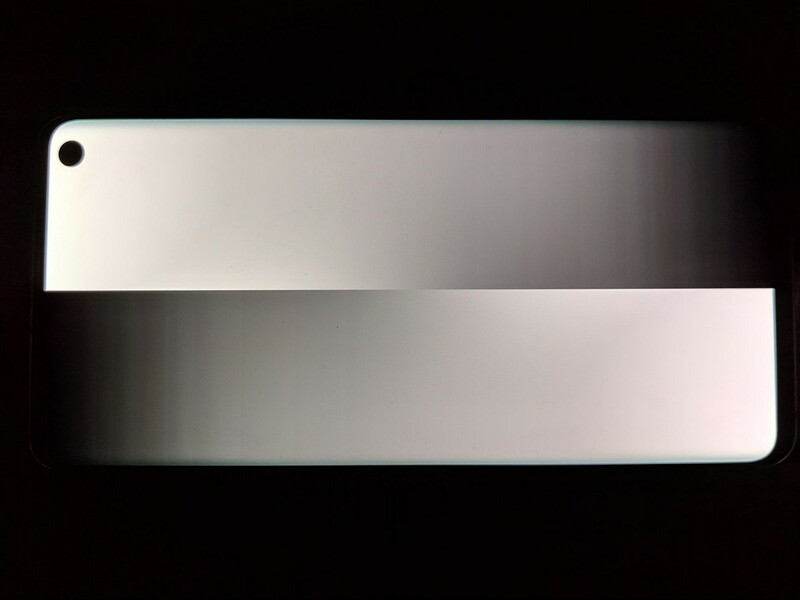 LCD panels do not exhibit this characteristic (barring local dimming), and because of it, they tend to be much brighter at higher APLs than OLED panels. There are no surprises here — the Samsung Galaxy S10 has the brightest OLED in the business in its auto brightness mode. But first, for those who are not completely familiar with average pixel levels (APL for short), please make sure to read our description of it above to be able to properly interpret the numbers for the luminance output of an OLED display. A display’s luminance at maximum system brightness is lowest when the screen is filled completely with all white pixels, which is an APL of 100%. We measure at this condition to record the lower bound or worst-case value for the luminance of white on a screen. We recorded the Samsung Galaxy S10 to emit 723 nits at 100% APL. This is the brightest OLED display we’ve measured at this APL by a decent margin. At a more accommodating APL of 50%, the display luminance can go up to 893 nits, which is bright enough to be comfortably legible outdoors when not under direct sunlight. Higher brightness is still required to adequately withstand the contrast given off by direct sunlight. 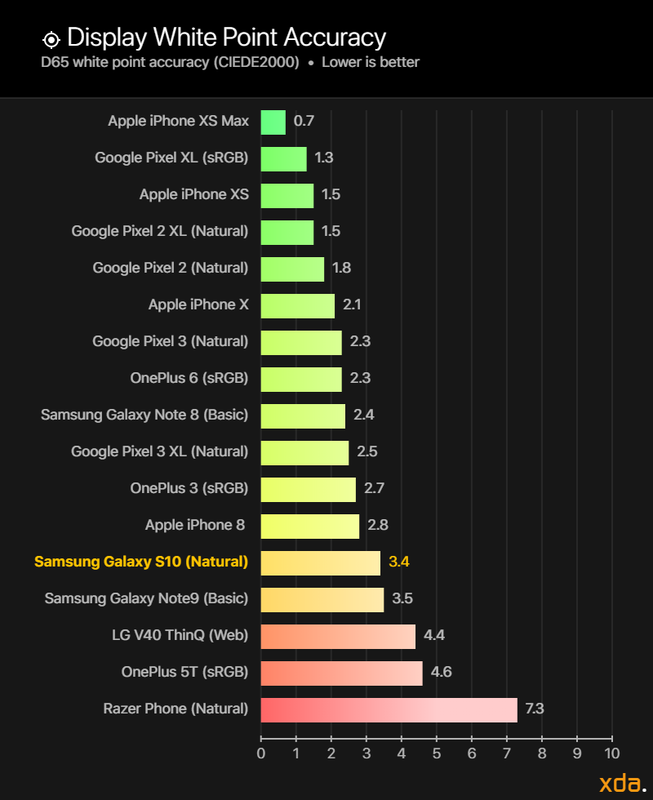 DisplayMate’s review on the Samsung Galaxy S10 boasted a “Record Peak Brightness of 1,215 nits,” which is impressive, but not a proper figure to represent the typical peak brightness of the display. 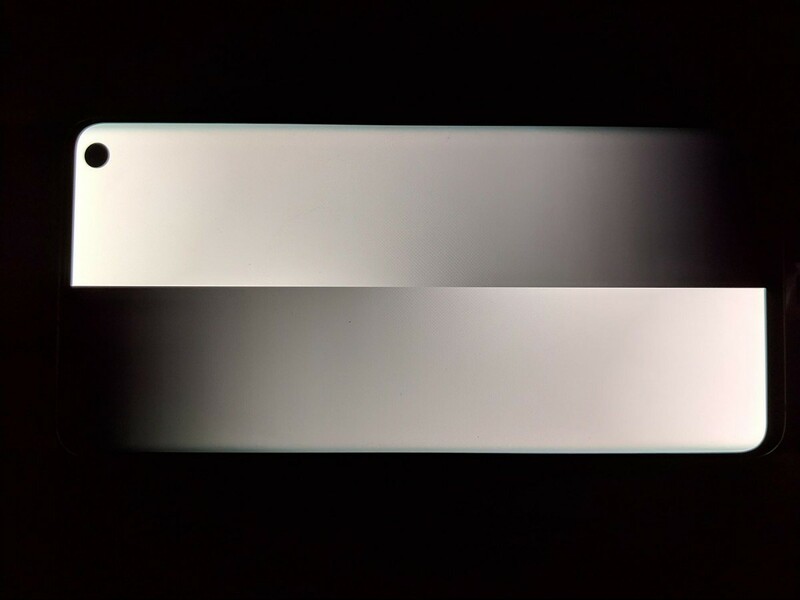 This figure represents the peak luminance at 1% APL, with barely any lit pixels on the screen, at which we measured 1,180 nits on our own Galaxy S10. Brightness figures at low APLs are primarily to gauge the intensity level of specular highlights in HDR content, and even then, the APL of most films fall around 15-20%, not 1%. However, at 10% APL, which is a very dark lower bound for HDR content, we measured the brightness at 1,068 nits, which is fantastic with not too much fall-off compared to 1% APL. The Samsung Galaxy S10 is tied with the iPhone XS for the dimmest at 50% APL, capable of dropping down to 1.8 nits. This is about 20% lower than the Google Pixel 3, the Google Pixel 3 XL, and the LG V40 ThinQ at their lowest, which measured at 2.4 nits, 2.2 nits, and 2.3 nits, respectively. The gamma of a display determines the overall image contrast and lightness of the colors on a screen. The industry standard gamma that is to be used on most displays follows a power function of 2.20. Higher display gamma powers will result in higher image contrast and darker color mixtures, which the film industry is progressing towards, but smartphones are viewed in many different lighting conditions where higher gamma powers are not appropriate. Our gamma plot below is a log-log representation of a color’s lightness as seen on the Samsung Galaxy S10 display versus its associated input drive level. Measured points that are higher than the 2.20 line mean the color tone appears brighter than standard, while lower than the 2.20 line means the color tone appears darker than standard. The axes are scaled logarithmically since the human eye has a logarithmic response to perceived brightness. Most modern flagship smartphone displays now come with calibrated color profiles that are chromatically accurate. However, due to OLED’s property of lowering the average lightness of the colors on the screen with increasing content APL, the main difference in the total color accuracy of modern flagship OLED displays is now in the resulting gamma of the display. The gamma makes up the achromatic (grayscale component) image, or the structure of the image, which humans are more sensitive in perceiving. Therefore, it is very important that the resulting gamma of a display matches with that of the content’s, which typically follows the industry standard 2.20 power function. Starting from the Galaxy S9, Samsung has made great strides in their DDIC for improving the resulting display gamma in their panels. They’ve managed to tightly control the brightness differential response to APL so that their electro-optical transfer function is minimally impacted and remains close to its target. On the Samsung Galaxy Note 8, we measured a gamma range of 2.3 up to 2.6 in its “Basic” screen mode, which resulted in too dark of colors and too much contrast. With the Galaxy S10, Samsung managed to hit a fitted display gamma of 2.15 in its color-accurate “Natural” mode and 2.27 in its color-stretching “Vivid” mode, which is much closer to the industry standard target of 2.2. The Samsung Galaxy S10 transfer function appears to be non-constant and piecewise, however. Instead of a straight power of 2.2, the S10 panel has lifted shadows that are lighter than the 2.2 standard and mid-tones that are slightly darker. The overall transfer function closely resembles that of the sRGB specification. However, the sRGB transfer function describes an encoding gamma, not a decoding gamma, that is meant to mirror the appearance as what would be seen on a CRT display, none of which even followed the sRGB transfer function spec for decoding. As it stands, the current transfer function of the “Natural” mode on the Samsung Galaxy S10 isn’t ideal for high-fidelity SDR playback or streaming, especially in dark viewing environments, where a gamma power closer to 2.4 is desirable. However, this is considered during video playback on the Galaxy S10, where Samsung’s mDNIe increases the contrast on the display, un-lifting the shadows. With this adjustment, the resulting display gamma now increases to a straight gamma of about 2.25, which is much more appropriate for video. The default lighter gamma of 2.15 throughout the rest of the OS is likely a design choice for viewing media in well-lit environments like in offices where lower (lighter) gammas are needed to combat the ambient lighting, which results in higher perceptual color accuracy in those environments. Furthermore, during High Brightness Mode, which is triggered when the ambient light sensor detects bright intense light like sunlight, Samsung’s mDNIe significantly reduces the screen contrast and lightens all color mixtures to improve sunlight legibility and perceived color accuracy. Samsung also provides a “Video enhancer” option, which slightly increases color saturation in all directions (not stretching to a specific gamut), significantly increasing the brightness of the display (which allows videos to reach High Brightness Mode luminance levels), and re-lifting the un-lifted shadows. One disappointment about the Samsung Galaxy S10 panel is the presence of color banding and aberration in the “Natural” profile, which shouldn’t be an issue on a flagship display, especially on its “color-accurate” mode. Granted, it is difficult to properly calibrate a wide color gamut panel to sRGB without banding, but others have been successful in doing so (iPhone XS, LG V40 ThinQ), and there is no excuse for an industry leader like Samsung to be having this issue. The Google Pixel 3 XL also has minor color banding in its “Natural” profile, but to a significantly lesser extent than the Samsung Galaxy S10. This is not the first occurrence though, as previous-generation Galaxy devices also observed banding in their calibrated reference profiles. Lastly, the Samsung Galaxy S10 improves in its ability to display near-blacks, likely assisted by its improved gamma control and lifted shadows. We measured the Galaxy S10 display to clip blacks at drive levels below 1.0% at 10 nits, which is an improvement over its 2.7% on previous generations, but still behind the likes of OnePlus and Apple, whose latest OLED panels have measured to clip blacks below 0.4% and 0% (zero measured black clipping), respectively, at 10 nits. The color temperature of a white light source describes how “warm” or “cold” the light appears. Color typically needs at least two points to be described, while correlated color temperature is a one-dimensional descriptor that leaves out essential chromaticity information for simplicity. The sRGB color space targets a white point with a D65 (6504 K) color temperature. Targeting a white point with D65 color temperature is essential in color accuracy since the white point affects the appearance of every color mixture. Note that, however, a white point with a correlated color temperature that is close to 6504 K may not necessarily appear accurate! There are many color mixtures that can have the same correlated color temperature (called iso-CCT lines) — some that don’t even appear white. Because of this, color temperature should not be used as a metric for white point color accuracy. Instead, we use it as a tool to represent the rough appearance of the white point of a display and how it shifts over its brightness and grayscale. Regardless of the target color temperature of a display, ideally its correlated color temperature of white should remain consistent at all drive levels, which would appear as a straight line in our chart below. By observing the color temperature chart at minimum brightness we can get an idea of how the Samsung Galaxy S10’s panel handles low drive levels before clipping blacks. 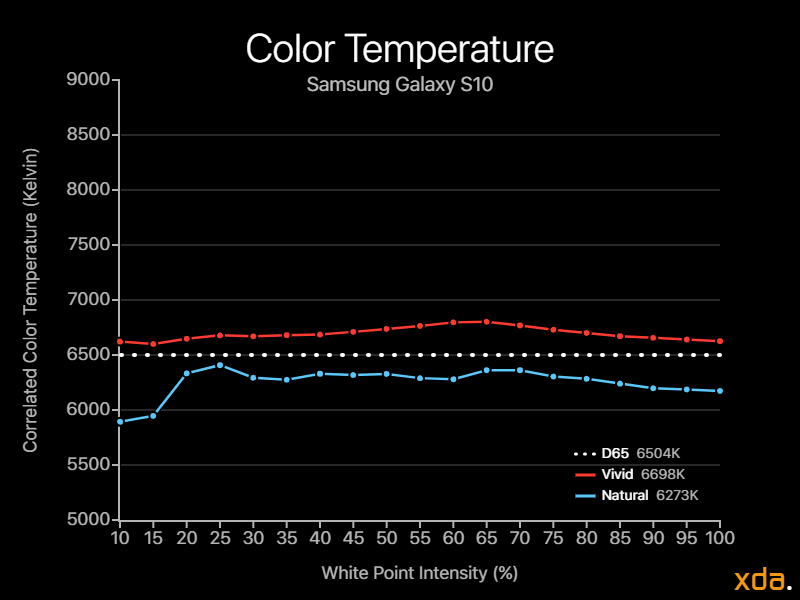 Continuing the trend of past generations, the Samsung Galaxy S10 display color temperature remains consistently too warm in its “Natural” profile, formerly the “Basic” profile, with a white point of 6172 K. This is a bigger deal now, though, since the “Natural” profile is the default color profile for Galaxy S10 users in the U.S. and parts of Europe, and many may be put off by the yellowish tint, which is often associated with something being aged or dirtied. This warm tint has been present in every single Samsung handset I’ve encountered since the Galaxy S8, and it is a major calibration issue that Samsung needs to improve, especially now that they’re pushing “Natural” as a default profile. 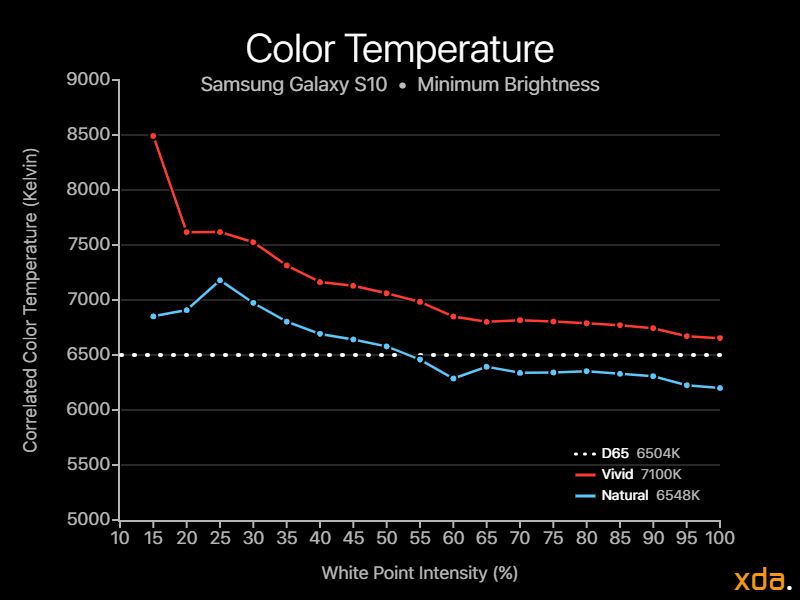 With respect to the drive variance, the Samsung Galaxy S10 has very little drive differential in its “Vivid” profile, as seen by its smooth and straight average color temperature curve. There is slight variance, however, in the “Natural” profile, with a noticeable spike towards a warmer tint at drive levels below 20% which isn’t present in the “Vivid” profile. 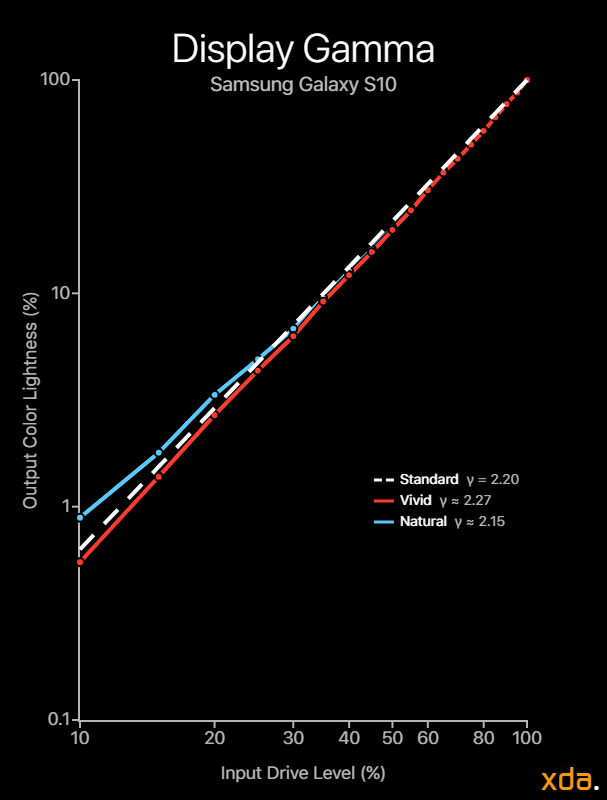 When observing the color temperature chart at minimum brightness, both profiles trend upwards in color temperature as drive levels lower, steadily losing the red emitter and overcompensating with green, moving towards cyan before finally clipping black. 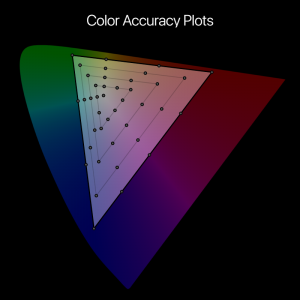 Our color accuracy plots provide readers with a rough assessment of the color performance and calibration trends of a display. Shown below is the base for the color accuracy targets, plotted on the CIE 1976 chromaticity scale, with the circles representing the target colors. 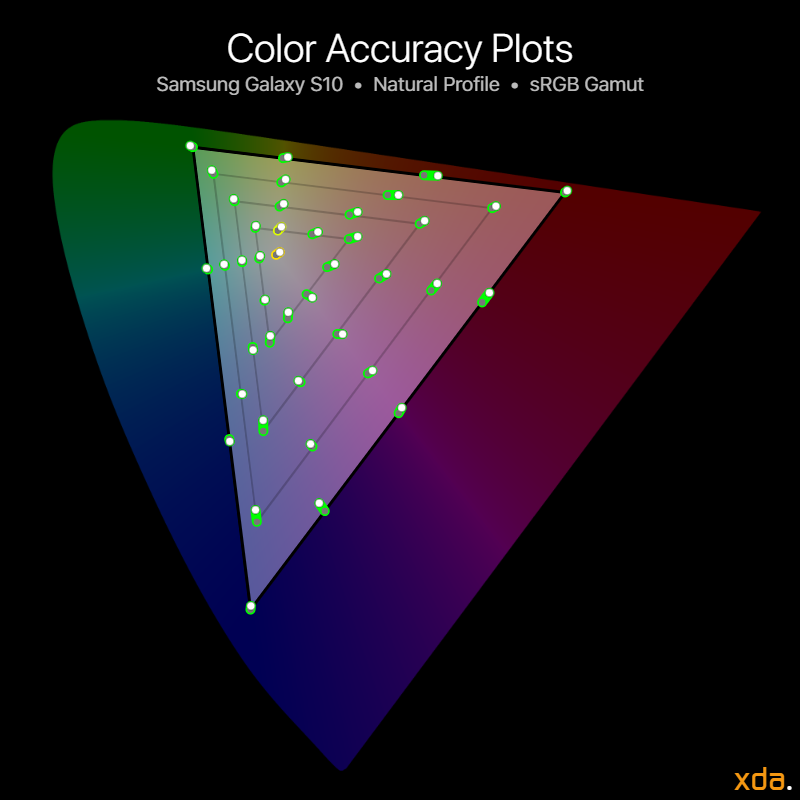 In the color accuracy plots below, the white dots represent the position of the Samsung Galaxy S10’s measured colors. The associated trailing color represents the severity of the color error. Green trails signify that the measured color difference is very small and that the color appears accurate on the display, while yellow trails indicate noticeable color differences, with higher severity at orange and red trails. 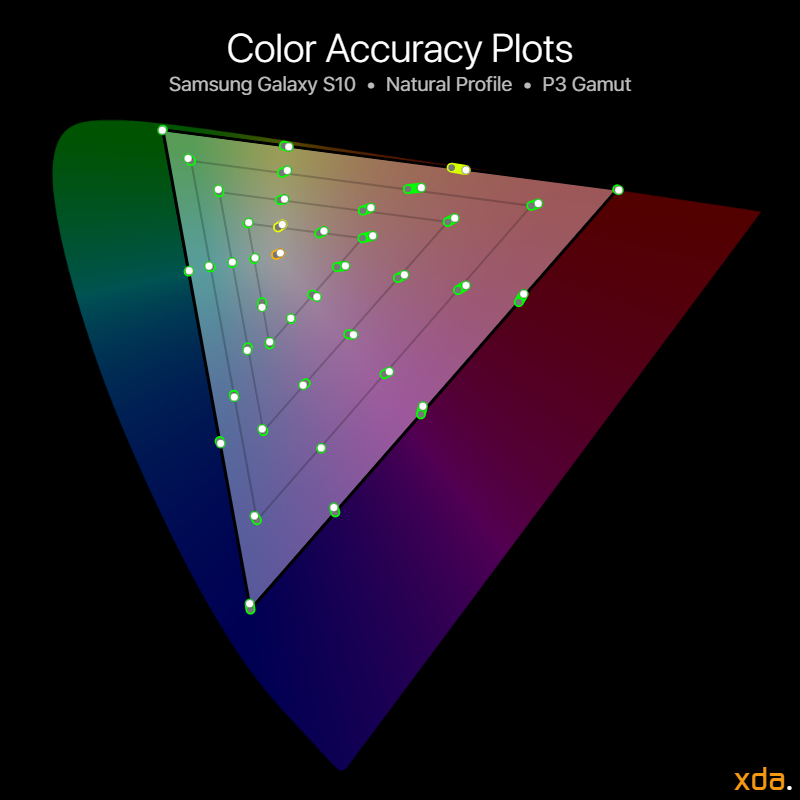 The Samsung Galaxy S10’s color accuracy plots show that its calibration is predominantly shifted towards red, though almost all of the color differences are unnoticeable except for white, lowly-saturated yellows, and highly-saturated red-yellows. The “Natural” profile, which now supports Android’s color management, excellently reproduces both the standard RGB color space and the wide P3 color space, with an average ΔE of 1.2 for sRGB and an average ΔE of 1.1 for P3. The profile’s maximum errors are also very low and appear pretty accurate, with a maximum ΔE of 2.6 for 25% yellow for sRGB and a maximum ΔE of 2.8 for 25% yellow for P3. The profile’s color accuracy combined with its standard gamma and support for automatic color management in its Gallery app allows the Samsung Galaxy S10 to reproduce most photos and SDR videos that are not white point-sensitive with professional high fidelity. However, the Samsung Galaxy S10, and any other Android for that matter, should still not be used to professionally edit color-sensitive photos or videos, since photo editor apps with working color management support are still non-existent on Android. This is still best left to Apple devices, including iPhones and iPads, or desktop workstations with a proper ICC color profile. The “Vivid” profile, formerly the “Adaptive” profile, was the default color profile in previous Galaxy devices and remains the default on the Samsung Galaxy S10 in Asia and parts of Europe. The profile is not color-accurate by any standard and stretches colors out to appear more saturated while embracing a cooler white point. 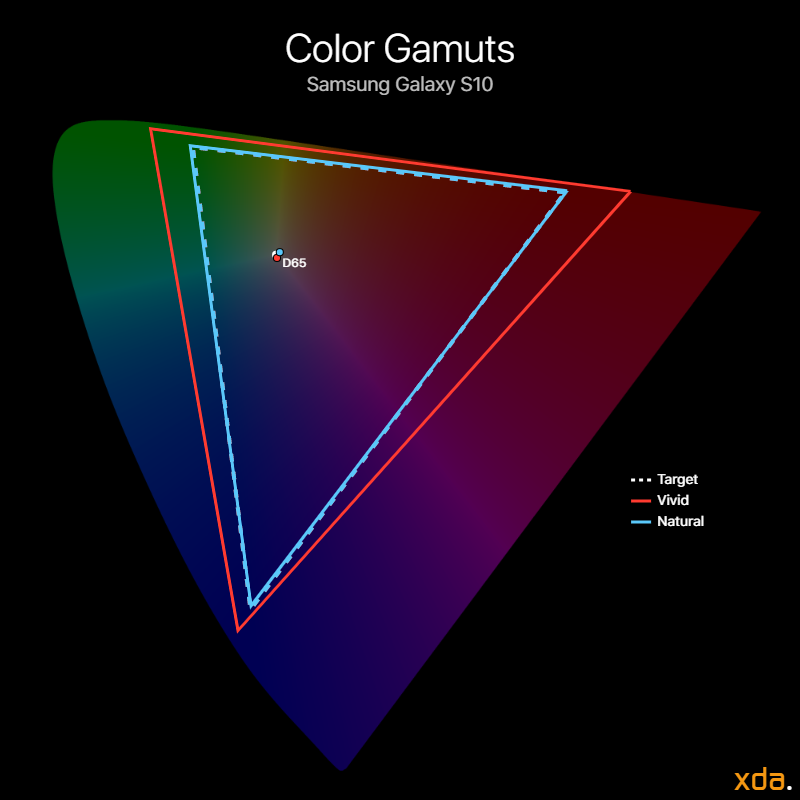 The gamut can be seen in the Color Gamuts diagram. In this profile, the white point is just-slightly cold by default at 6624 K, and colors are heavily increased in saturation with an average ΔC (change in chrominance/saturation) of 13.6. The screen’s contrast is also increased compared to the “Natural” profile, jumping from the piecewise lower gamma of 2.15 to a punchier straight gamma of 2.27. Reds in the “Vivid” profile receive a straight increase in saturation with the same hue as sRGB red, with the red primary having a ΔC of 17.9. Greens are boosted the most in this profile, with a chromaticity boost ΔC of 26.2, and with greens being shifted towards sRGB cyan with ΔH = 8.1. Blues are the least modified, but still noticeably so. The blue primary has an increased chrominance ΔC of 6.8 slightly in the direction of sRGB cyan with ΔH = 1.2. The “Vivid” profile should not be used at all for any color-accurate editing or viewing, or when editing photos to be shared with others. At this point, there’s just so much that Samsung has done well. The Samsung Galaxy S10’s display delivers on nearly every critical display panel characteristic, and the most important thing left is color management adoption throughout Android. When a display is this good, the nitpicky flaws come to greater attention. As I mentioned in the beginning, Samsung’s panels are not perfect, and the Galaxy S10, too, was revealed to have flaws throughout my review of it. From a purely display-geek and professional calibration-driven point-of-view, however, the iPhone XS is still the superior display package, with textbook ISF calibration at any white level with the least drive variance, superior shadow rendering/black clipping and subpixel response time control, and the company leader in color management support and understanding in colorimetry, receiving the higher A+ grade. In regards to the Galaxy S10’s display resolution, from a “min/max” point-of-view, Samsung chose a non-ideal (terrible, actually) combination of panel resolution and default render resolution to maximize sharpness and minimize power consumption. It’s important to talk about this because default options make up how the phone is to be represented by the company to the public, and the option will be left alone by many. By deliberately selecting this rendering resolution as the default, it represents what Samsung thinks is the best user experience for its balance of sharpness and power consumption. This is an approach that sacrifices a more-ideal default experience (that doesn’t upscale by a non-integer factor) for the option of a higher resolution, which is included for those who require the extra pixel density, perhaps for VR or to accommodate their higher visual acuity. Ultimately, the balance is best found by tackling it with hardware, like how Apple does with their resolution-specific panels (with higher default PPIs than Samsungs’), but this removes the option for the even-higher resolutions that Samsung provides. Some may find the default option underwhelming while finding the higher resolution overkill, but with no intermediary options, some may find Apple’s approach to panel resolution superior. Staying on the topic of default options, Samsung’s decision in changing the default color profile to the accurate color profile, even if only in certain regions, is a significant one, especially when knowing that many of their consumers enjoy the punchier colors of their “Adaptive” (now “Vivid”) profile. However, this is the step needed to push color management in Android into the hands of developers and consumers, allowing a greater range of tools in colorimetry and color quality, and allowing industrial strides to take place to deliver cutting-edge technologies like HDR10+ content to all. This can now begin to be possible since Samsung, Android’s market leader, implemented Android’s automatic color management which was introduced in Android 8.0 Oreo. 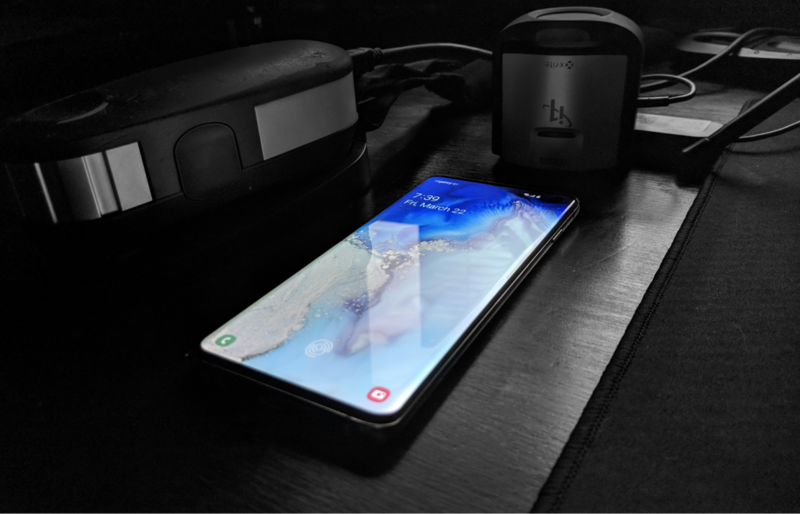 However, at the time of this writing, there is very little app support for Android’s color management, and only Samsung’s Gallery app on the Galaxy S10 is readily available to display photos and videos with embedded ICC color profiles, with Google’s Photos app only recently beginning to roll out support for it. A lot of its lack of support is due to Android’s fragmented nature and lack of push for color accuracy and color management, but there is also Google to blame for their relatively poor implementation and lack of documentation, resources, and attention to the subject compared to Apple, who advocate for use of wide color and color management in their interface guidelines. I previously wrote a rant about this in my previous Pixel 3 display review, so I’ll spare this one the rest of the details. What Android needs is Samsung pushing color even further, driven by their innovation to allow HDR10+ content to be properly displayed on all devices, and perhaps later adopt wide color image capture and sharing. A future not just with hole punches, but where Android apps and users can enjoy all the vibrant colors, to unleash the full capabilities of our already-capable camera sensors and display panels. It might just start with the Galaxy S10, but hopefully, Samsung can work with Google, and — like its code name suggests — go even further Beyond.